Pool D may not be the “Pool of Death” this year in the Mixed Division, but perhaps it should be deemed the “Pool of Doubt.” There are reasons to believe three of these four teams could fight their way to the semifinals, or even beyond, but there’s also concerns to be had about each team. Whether it’s due to roster changes, up and down performances, or a lack of quality wins and competition, Pool D’s new title is less about doubting the teams and more about doubting the seedings to hold or any sure order of finish. #4 Seattle BFG arrives in San Diego with a Club Worlds title in tow. With wins over fellow top seeds Seattle Mixtape and Minneapolis Drag’n Thrust, as well as poolmates Boston Slow White, to their name, they’ve built an impressive resume, although all of those successes were earned at the U.S. Open in August. The losses of Rena Kawabata and Kieran Kelly contributed to a drop-off at the Pro Championships, though, as BFG suffered losses to Mixtape and Drag’n Thrust, in addition to a surprising loss to Minneapolis No Touching! However, BFG righted the ship at Northwest Regionals to hold off Boise Lochsa, finish second behind Mixtape, and keep their Nationals bid. Of the teams in Pool D, BFG has only played Slow White this season, winning games in both the WUCC final and at the U.S. Open. Their matchup in the first game could set the tone for the rest of the tournament for both teams, although both rosters now look quite a bit different from their indoor contest on the international stage. A hot Boston Snake Country will challenge BFG in their last game on Thursday, while Columbus Cocktails play spoiler. If BFG plays well, they could come close to replicating their Club Worlds results, but the two Boston squads could also drop BFG down into a tough prequarters matchup. BFG will need to make up for the production of Kawabata and Kelly and will do so by relying on a strong group of veterans. New addition Mario O’Brien joins with Sam Pickel and Tommy Li to form a formidable back line for their defense, and they’ll be looking to work it to BFG’s outstanding women, headlined by Lindsay Simon Fox and captains Lili Gu and Alexa Kirkland. The Seattle squad’s losses have stolen the spotlight, but there is a very talented and well-rounded group remaining, and those expecting a pushover should look elsewhere. #5 Boston Snake Country is in their first year of competition but enters San Diego as Northeast Regional champions. Comprised of a core of Middlebury alumni, Snake Country had a strong season, with two of their four losses coming to Philadelphia AMP and wins over Nationals teams Space Heater, Jughandle, and XIST. However, they have not been tested much outside of those matchups and were fortunate (or unfortunate, as the team sees it) to avoid having to play fellow Boston teams Slow White and Wild Card in their undefeated run to the Northeast title. Keep up that momentum and Snake Country could see themselves on a deep run, but if the magic has run out in the last month, they could find themselves vulnerable to stronger competition in prequarters. Snake Country relies heavy on contributions from Middlebury and Slow White alumni, with Lexi Zalk being in the middle of it all. Captains Peter Prial and Erin Rea lead them on offense, while Chris Waite, Davis Whitehead, and Annie Fisher head up the Snake Country D-line. Their women are athletic and run deep, allowing them to constrict teams over the course of a game. Despite being from the same city, Snake Country and Slow White did not play this season, and Snake Country also did not get a chance to play BFG or Cocktails. Pool play will be a clear test of their potential. The matchups get progressively more difficult throughout the day, starting with Cocktails before ending with the 4-5 matchup with BFG. With their uncertainties, Snake Country could ride early energy and win the pool or falter as the competition gets more difficult. #13 Boston Slow White had an up and down year, bookended by a runners-up finish at Club Worlds and a battle with Boston Wild Card for the final Northeast bid. Slow White have wins over Mixtape, Wild Card, and Jughandle to their credit this season, but also an out-of-character two-win Pro Championships. Their losses, though, have come mostly to Nationals-qualifying teams, including the top four seeds this year, although a shock loss to Brooklyn Grand Army in Regionals dropped them into the third place bracket, where they won out to secure the final bid. Slow White has shown that they can compete with the best in the world this year, but a lack of recent signature wins leads to questions about their current form and how far that can take them. Their midday game against Snake Country will likely settle the argument of top Northeast mixed team this season. Slow White opens with BFG, who they have seen and lost to twice this season, at WUCC and the U.S. Open. Pull an upset there and Slow White could set themselves up well for the rest of the day and potentially the rest of the tournament. The final matchup against Cocktails might be a possible trap game after the BFG match, but Slow White seems likely to still be in contention come Friday morning. While Slow White did lose some players after Worlds, they still retain Pat Barron, who was a standout on defense in the Northeast game-to-go, and Todd Herman, who made some key catches in that game as well. Don’t forget about Jeff Smith, whose reputation speaks for itself. Slow White’s women are led by captain Hannah Baranes and Rachael Westgate, who caught the goal that sent Slow White to San Diego. Columbus Cocktails enters Nationals as the lone representative from the Great Lakes region, going undefeated in their last three tournaments including Sectionals and Regionals. Cocktails have not been tested much, though, as a down year for the region left them with only the Elite-Select Challenge to compete against Nationals-caliber talent. At ESC, they took heavy losses to Durham Toro and San Francisco teams Mischief and Polar Bears en route to a winless weekend in a hometown tournament. However, they upset recent Nationals contenders Cincinnati Steamboat at Sectionals before running the table at Regionals and claiming their first ever bid to Nationals. Given their paucity of high level competition this season, Cocktails will be trying to play more of a spoiler role, and if they catch either of the Boston teams playing down, they could find themselves with a chance come Friday morning. Cocktails come into San Diego with a high-powered offense headed by Ben Sever, Ryan Kindell, and Sion Agami, while their defense is led by Emily Barrett and Sadie Jezierski, who sparked Cocktails’ Sectionals win over Steamboat and their continued success at Regionals. Cocktails have not played any of their poolmates this season as neither the Boston teams nor BFG attended ESC. Despite coming in as significant underdogs, as the only unranked team in the Nationals field in any division, Cocktails will look to surprise Snake Country in their first game or catch Slow White coming down from the Boston showdown happening midday. Their game against BFG will give Cocktails a chance to measure up to the Club World champions, something that will be helpful to their team development going forward regardless of the result. 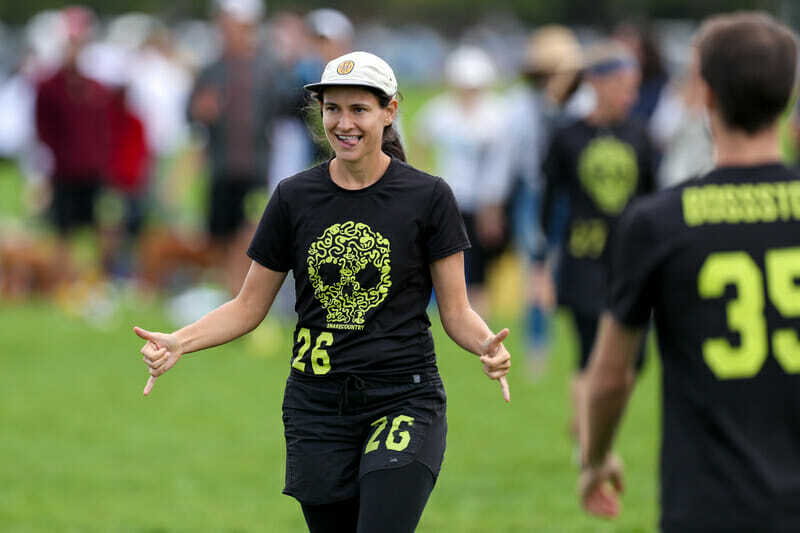 Jenna started playing ultimate at UC Berkeley before moving north to Reno, Nevada where she continued to play at the University of Nevada, Reno. She has also competed with Cutthroat, a mixed club team out of Reno. Comments on "Club Championships 2018: Pool D Preview (Mixed)"